THE READING NOOK Cam faces a startling truth hidden in a dim memory. MUSIC TO YOUR EARS It took a dentist and few interesting happenstances to bring a brass band that plays everything from soft, romantic love songs to energetic marches to the Performing Arts Center. Pg. 4 A locally owned, independent publication dedicated to higher standards of journalism. Blake House Publishing, LLC sincerity. There is no deadline for forgiveness, it should not be given until change is proven. Have you healed? For as long as it takes for the bones to knit, for the bruises to fade away, for the pain and heartache to heal, they should have to wait for forgiveness. Being granted forgiveness is not a right, granting it is not a requirement. It is a gi . This Mother’s Day, forgiveness is not a gi my mother will be given from me. She once again will receive the silence she earned through the horrific abuse she was so sure no one would remember. I have forgiven myself for being too small, too weak, too young to stop the abuse or to save others. I forgive myself for not being perfect. I am comfortable with the knowledge that every day I do my best to bring joy to the world and that my children are the first in four generations to not be abused. To good mothers and to those who have mothers who loved them, a joyous, happy Mother’s Day to you. It was your existence that gave me hope when I needed it most. Joy@BlakeHousePublishing.com JOY of MEDINA COUNTY MAGAZINE is published monthly by Blake House Publishing, LLC, 1114 N. Court, #144, Medina, Ohio 44256. It is distributed as an e-edition and in a print edition. Both editions can be found at JoyofMedinaCountyMagazine.com Copyright 2018-2019 by Blake House Publishing, LLC. All rights reserved. Reproduction or use of editorial or pictorial content without written permission from the publisher is strictly prohibited. Any unsolicited materials, manuscripts, artwork, cartoons, or photos will not be returned. There were a lot of smiles and dancing at the Medina County celebration of 100 years of 4-H in the county. FOLLOW THE BAND! A noteworthy quest. The second clue to solving the mystery of finding networking partners. If you think starting a business will be easy, you might want to think again. Born from the love of music and led by a world-renowned music director, this brass band delivers a noteworthy musical experience to PAC audiences five times a year. Making art with wiggly baby feet and hands and enjoying the Perfect Girl Band. Full of texture and flavor, this recipe utilizes four diﬀerent cheeses to create a filling meal. Devin forces Cam to face a distant memory and a deep family secret. 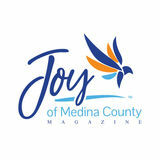 Joy of Medina County Magazine is distributed as an e-edition and in print. 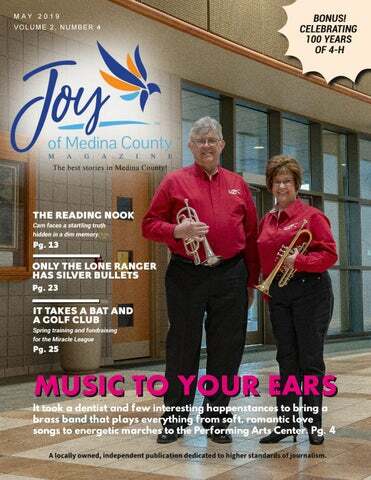 Go to JoyofMedinaCountyMagazine.com to sign up for a subscription, to order print issues and photos, and to find additional features, as well as a list of open positions and an index of the past issues. The last column in a series about basements and mold’s sneaky hiding places. ON THE COVER: Second cornet players, Paul Rocco, from Medina, and Lu Ann Gresh, from Wadsworth, pause in the lobby of the Performing Arts Center before a concert with the Brass Band of the Western Reserve. As the call of “Play ball!” goes out across the field, players of all abilities hit balls and scramble for bases. May we help you find great activities and events for all members of the family? and members dressed in bright red shirts and crisp black pants enter the stage, highly polished brass instruments gleaming under the lights. The band director quickly enters the stage, his brisk step showing his eagerness to begin the performance. He turns and smiles at the audience and, with a slight bow, welcomes them in his English accent. He turns to the band, the baton rises, pauses mid-air, then swoops down in a forceful arc. What comes next is not the loud noise expected from a brass band but music such as the lilting notes of “Waltzing Matilda” or the engaging sounds of “Nobody Does it Better” that has the audience wanting more. It is the unexpected that the band’s director, Keith Wilkinson, specializes in. His eyes twinkle when he asks newcomers during intermission if the music was what they expected. He smiles with satisfaction when they express their surprise. He is known for pausing during a show to ask the audience if they are enjoying the music, which is always met with enthusiastic applause. Wilkinson knows the Brass Band of the Western Reserve can be very surprising. He said he knows that when people think of a brass band, they think of noisy crashing sounds, not the music that his band delivers. He is frustrated trying to determine how he can educate more people about the professional level of music that his 30-some member band performs. “Our goal is always the highest musical standards,” Wilkinson says. He has gotten used to the fact that, when he starts speaking, people are surprised by his English accent, and they have lots of questions about his origins and how he ended up here. Abigail Mollenkopf pauses in her cookie munching to pose with her father, David Mollenkopf, BBWR second trombone. Steve and Jeri Scafidi handle the sales table. They are the parents of Nicole Scafidi, the band's solo horn player. From left, Kenneth Smith, solo cornet player Marcia Kline, and Mary Lee Smith. The Smiths are long­time concert attendees from Norton and Kline was one of the founding members of the BBWR. From left, Weijuan Zhou­Gates, BBWR principal cornet player Andrew Gates, Carol Harris, Brian Gates, and Kimberly Gates. Anthony Chiporo performs a solo on the flugel horn. Keith Wilkinson, BBWR music director, on right, chats with a concert attendee and Steve and Jeri Scafidi, seated, and Kathy Navarro. Scott Purdum performs a cornet solo. Keith Wilkinson addresses the audience. seniors, $5 for college students, and free for high school students. Nursing and retirement home groups are charged $5 per ticket. To sample for free the music the BBWR delivers, go to https://bit.ly/2P3dydr . You just may be surprised. Jennifer Mollenkopf and Victor Lee, principal percussion. David and Olivia Evans, BBWR euphonium player. Michael Greene, BBWR tuba player, and Paityn Brumfield. Jessica Payne, first baritone, performs a solo. Marissa, Devin, and I sat in my dad’s apartment, awaiting Lea and Lilith’s arrival. The letter we’d received said they were already on their way, so we didn’t want to miss them. In the meantime, Marissa was showing me another one of her poems while Devin was texting someone, probably Heath. It turned out Marissa had snuck into her secret room in the bowling alley one last time after we returned from London and cleaned it out herself. After I’d discovered the sealed vent shaft, I asked her about it, and she told me she had retrieved every poem, notebook, guitar, and beanbag chair from that place, and left only one thing: the blades. Afterward, she called the bowling alley anonymously and told them she had heard rumors that some teens were using the unused vents for hiding places. It was welded shut the very next day. At her mention of the blades, my eyebrows rose. She made eye contact with me, and said, “We don’t need those anymore, Cameron. They can stay locked away in there forever.” And I didn’t disagree. Now, she was showing me some of her older poems and asking me what I thought about them. It was a nice way to keep my mind off of what we were waiting for. The main problem with deciding that we’d face them was that we didn’t know where they were or how close they were to arriving at the apartment. I just hoped they were a few days away, because I was not prepared for them. “Heath says ‘good luck,’” Devin spoke suddenly. returned to his place. It was quiet, as his dad was out on a work trip again, and his mom was already in bed. We walked into a dark living room and Devin stopped, without turning on any lights, and turned to me. “Devin?” I asked in the dark. “Something’s been bothering me, Cam.” “Yeah?” “Well, you relayed the exchange you had with Lea to us, but I’m still confused about something,” he said, leaning against the wall, effectively imprisoning me between him and the door behind me. I tried to laugh off the discomfort he was causing me and shrug, but he wasn’t having it. He stepped forward, giving me very little breathing room, and looked right into my eyes. “Cam, you said that Lea said you weren’t an only child, and then you called her crazy. But why would she say that? What in the world would have put the thought in her head that you had some sort of sibling other than her? And, also, how come your mother told her that your father hurt her so badly? Things just aren’t adding up, and I don’t think you can point all the blame at a crazy mother.” “Devin, you’re tired, let’s go to sleep,” I tried to argue and push past him, but he grabbed my shoulder and held me firmly in place. He had quite the grip. “Cameron. Are you keeping something from me?” Devin frowned hard. The wrinkles in his brow were so deep you could’ve used them as a castle’s moat. Julie Wiseman, in a floral dress, concentrates on dance steps while Kayligh Ethington, in a blue­and­white patterned dress, is caught dancing on air. There were lots of laughs, dancing and prizes to celebrate the 100th birthday of the Medina County 4­H at Root Candles in Medina. They left Earth: Putting some lift in their dance steps are, from left, Logan Spittle, Quade Mainzer and Varun Natarajan. Leading the way are Logan Spittle in front and Colleen Flannery in a light green shirt, as Quade Mainzer does a cross step and, behind him, Cecilia Mainzer puts an extra twist to her dance. It was fun for all as a skipping and smiling Lydia Flores, OSU Extension program assistant, left; Barry Jolif, teamwork and team play recreational leader; and Morgan Domokos, 4­H Extension educator, enjoy a dance. Looks like there was more than one line dance happening at once! With legs in the air were, from left, Halen Kochmit, Sophie Terwilliger, Erika Evans, Natalie Cunningham, and Domonique Yatsko. From left, Ashlynn Reck, Caley Chung and Taylor Domokos share a laugh at the 4­H birthday party. With a kick and a clap, the party rolled on! Out in front were, from left, Amelia Mainzer, Varun Natarajan and Colleen Flannery. Adding a touch of royalty to the party were, from left, 2018 Erie County Fair Queen Kalynn Welch, 2018 Erie County Fair king first runner­up Morgan Otto, and 2018 Medina County Fair Queen Grace Braver. Joyful Word Search Follow the Band! THE IN BOX Silver Bullets by Steve Rak A wise old business man once said to me, “Son, there ain’t no silver bullets when it comes to running a business.” Ah, the old silver bullet theory, you know they have a new name for it now, it is called “hacking.” Do an Internet search for “business hacks” and you will find all kinds of articles and books about business hacking. Guess what? There are no successful business hacks, just like there are no silver bullets! I know quite a few business owners and not one of them has ever said to me that they hacked their way to the top. I never have had one person drag me into a corner and whisper, “Hey wanna see my silver bullet? It helped me make my first million.” Quite the contrary, my conversations usually go something like this: “Oh, you own a business too, how do you find employees? Because I’ve found that I’d rather stick my head into a vat of boiling lava than interview one more person that won’t show up on Monday.” So, here is the skinny: Business is hard. Remind yourself of that if you are planning on starting a business. If you already own a business, you probably try to stop reminding yourself of that on a daily basis. I am not trying to be a buzzkill, I am just keeping it real. There is no easy shortcut in business, there never has been. Business is hard and no silver bullet or hack will ever change that. Steve Rak is a resident of Medina, is an awardwinning columnist, and has spoken at various workshops and conferences throughout the United States and Canada. He is the owner of Rak Consulting, www.rakconsultingllc.com/ , and Southwest Landscape Management, www.sw-landscape.com/ If you have questions or suggestions for future column topics, please e-mail Joy@BlakeHousePublishing.com with “In Box” in the subject line. over the top. Then cover. Cook on low for four to five hours. Note: The onion can be omitted if you have onionsensitive people enjoying the lasagna with you. A second container of cottage cheese can be substituted for the ricotta cheese, if desired. Over recent months, we have spent considerable time on the basement area, and we will finish it now. The time spent is well warranted, as the basement may well be the No. 1 spot for mold growth in a home. While studying the peculiarities of your basement, take a moment to look up at the floor overhead. O entimes, if you have had an overflowing sink drain, tub or toilet, there are discolored lines (rivulets) of debris flowing down between the cracks of the subfloor where soap-filled water drained down through the subfloor. It does not mean there is mold between your hardwood floor and the subfloor, but it is a possibility. Professional air testing is likely to be the best way to identify any mold. If mold growth has occurred, the floor will act as a bellows when walked on and will spit out mold spores. An air test walking on the floor and then again a er should tell the story. Occasionally, the basement may have a side room that is under a porch. Usually the porch is built by putting down framing with plywood on top. Then cement is poured on top, and it is finished on the upper side to become a porch. In the winter, the cement gets very cold (as does the underside) and moisture (vapor) in the basement will hit dewpoint on the cement and condense into significant levels of water dripping from the ceiling in this room. Sooner or later there will be mold! The furnace in most basements will have three bionesting areas where mold will grow on its own. To avoid mold growth, have a HVAC service company clean these areas every few years: the evaporator coil, condensate pan, and drain line; the blower motor and squirrel cage fan; and the filter section. Paul McHam is a local expert on mold remediation. For more information, visit his website at http://myairxperts.com/ and his Facebook page Moldsporewars http://bit.ly/2E2Fj3y or call 330-658-2600. American Red Cross Blood Drive, 2 p.m. to 7 p.m., Holy Martyrs Church, 3100 S. Weymouth Road, Medina. https://rdcrss.org/2ybO4Rp American Red Cross Blood Drive, 2 p.m. to 7 p.m., Medina United Methodist Church, 4747 Foote Road, Medina. https://rdcrss.org/2ybO4Rp Bluegrass Jam and Dinner, 5:30 p.m. to 10 p.m., Lafayette United Methodist Church, 6201 Lafayette Road, Medina. Kitchen opens at 5:30 p.m., music starts at 7 p.m. Donation admission $3, dinner is additional donation request. Bring favorite dessert to share. Bluegrass bands welcome, arrive early to be scheduled. Monday, May 6 Beverage Day https://bit.ly/2Z8TZ82 and International No Diet Day https://bit.ly/2qaVhyv Make and Take, all day, all Medina County District Library locations. American Red Cross Blood Drive, 1 p.m. to 6 p.m., Montville Township Police Department, 6665 Wadsworth Road, Medina. https://rdcrss.org/2ybO4Rp Veterans Roundtable, 7 p.m. to 8 p.m., Medina Library, Community Rooms A and B, 210 S. Broadway Street, Medina. Veterans’ stories of survival. All Ages. No registration. based hiking series. Ages 7 and up. No registration. Free. Go to https://bit.ly/2AZ1DaZ for more details. American Red Cross Blood Drive, 11:30 a.m. to 4 p.m., Western Reserve Masonic Community, 4931 Nettleton Road, Medina. https://rdcrss.org/2ybO4Rp Make and Take for Moms, 2:15 p.m. to 3:15 p.m., Buckeye Library, 6625 Wolﬀ Road, Medina. Make floral gi . Grades 6 to 12. History of Tommy Lucas, 7:30 p.m. to 9 p.m., Meeting Room A and B, Wadsworth Library, 132 Broad Street, Wadsworth. Learn about Tommy Lucas and his contribution to Wadsworth. Thursday, May 9 Lost Sock Memorial Day https://bit.ly/2ZaOPIE Camp Wired, 9:30 a.m. to 11:30 a.m., Community Room B, Medina Library, 210 S. Broadway Street, Medina. Learn and refresh computer skills. Ages 55 plus. Call for topics, 330-725-0588. American Red Cross Blood Drive, 10 a.m. to 3 p.m. Summa Health Center at Wadsworth-Rittman, 195 Wadsworth Road, Wadsworth. https://rdcrss.org/2ybO4Rp Tween Scene: Mother’s Day Surprise, 4 p.m. to 5 p.m., Children’s Activity Room, Wadsworth Library, 132 Broad Street, Wadsworth. Make gi for mom. Ages 9 to 14. Register at https://bit.ly/2VH29Cs Raiders of the Lost Locker: Can You Escape? 4 p.m. to 5 p.m. and 5 p.m. to 6 p.m., Meeting Room A, Wadsworth Library, 132 Broad Street, Wadsworth. In the 1950s, lockboxes were used as lockers, help determine who an unopened locker belongs to. Ages 12 to 18. Register for 4 p.m. at https://bit.ly/2UgDGCp , register for 5 p.m. at https://bit.ly/2ZcrciI Legal Resource Center, 5:30 p.m. to 7 p.m., Brunswick Library, 3649 Center Road, Brunswick. Domestic Relations Court volunteers help those not represented by a lawyer in family court. First come, first served. non-members, $45. For more information, call 330-722-1341 or e-mail mchs@zoominternet.net. For reservations, send check, payable to MCHS, to 206 N. Elmwood Avenue, Medina, 44256. Medina High School Showtime, 7 p.m. to 9 p.m., Performing Arts Center, 851 Weymouth Road, Medina. Admission $10 at the door or at https://bit.ly/2UR8jTo How to Use Your Own Telescope! 8 p.m. to 11 p.m., Letha House Park West, 5800 Richman Road, Spencer. Cuyahoga Astronomical Association members will give instruction on how to use your own telescope. Free. Susan Hambley Nature Center, Brunswick. Learn more about Ohio’s largest salamander, the scarce 2-foot long Hellbender, through various activities. Free. Hydrangea School, 6 p.m. to 8 p.m., Root Community Room, 640 W. Liberty Street, Medina. Registration deadline is May 8 or when class is full. Learn about hydrangea varieties, care and selection and take a hydrangea home. More information at https://bit.ly/2TTVUcB Cost $30. Call 330-725-4911 to reserve spot. Writing as a Cra , 7 p.m. to 8 p.m., Children’s Activity Room, Wadsworth Library, 132 Broad Street, Wadsworth. Workshop by local author Seth Borgen to give writers a boost. Road, Brunswick. Benefits cancer research and cancer care. For pricing and registration, go to https://bit.ly/2Uv5GHi Friday, August 9 Medina Runs Down Cancer Series: Collin Cares Glow With the Flow 5k, 7:45 p.m. mile run kids and 8:15 p.m. 5k. Family friendly events, music, food. Glow in the dark “goodies.” For registration and pricing, go to https://collincares.net/ Sunday, September 15 Medina Runs Down Cancer Series: Race With Grace 5k, 9 a.m., Cleveland Clinic Medina Hospital, 1000 E. Washington Street, Medina. For registration and pricing, go to https://bit.ly/2KEHMoy largest salamander, the scarce 2-foot long Hellbender, through various activities. Free. Bluegrass Jam and Dinner, 5:30 p.m. to 10 p.m., Lafayette United Methodist Church, 6201 Lafayette Road, Medina. Kitchen opens at 5:30 p.m., music starts at 7 p.m. Donation admission $3, dinner is additional donation request. Bring favorite dessert to share. Bluegrass bands welcome, arrive early to be scheduled. 9 a.m. to noon Saturdays, June 15 through September 14 Central Intermediate School, 151 Main Street, Wadsworth Vendor registration information at https://bit.ly/2JykOKc 4 p.m to 7 p.m. Wednesdays: June 26, July 24, August 21 Village of St. Edward, 880 Main Street, Wadsworth Vendor registration information at https://bit.ly/2JykOKc breeding grounds. Free. Register at http://bit.ly/2HwOlpN Hospice of the Western Reserve Warehouse Sale, 8 a.m. to 4 p.m., Hospice of the Western Reserve headquarters, 17876 St. Clair Avenue, Cleveland. First of two days. Gently used home furnishings, artwork, lamps, dishes, jewelry, more. Route 42, Lafayette Road. Search for frogs, toads, salamanders with naturalist during blue moon. Sunday, May 19 World Plant a Vegetable Garden Day https://bit.ly/2Pb1OWi Hospice of the Western Reserve Warehouse Sale, noon to 4 p.m., Hospice of the Western Reserve headquarters, 17876 St. Clair Avenue, Cleveland. First of two days. Gently used home furnishings, artwork, lamps, dishes, jewelry, more. Giant Salamanders, noon to 5 p.m., Susan Hambley Nature Center, Brunswick. Learn more about Ohio’s largest salamander, the scarce 2-foot long Hellbender, through various activities. Free. Save Ohio Strays Meet and Greet, 1 p.m. to 3 p.m., Petco, 1052 Williams Reserve Boulevard, Wadsworth. Sunday Cinema Club: “On the Waterfront,” 2 p.m. to 5 p.m., Meeting Room A, Wadsworth Library, 132 Broad Street, Wadsworth. Free. Natural Discoveries Program Hiking Series: Moss Mosey, 3 p.m. to 4 p.m., River Styx Park, 8200 River Styx Road, Wadsworth. Award-based hiking series. Learn moss biology and how to distinguish common moss groups. Ages 7 and up. Free. No registration. Go to https://bit.ly/2AZ1DaZ for more details. Monday, May 20 Make and Take, all day, all Medina County District Library locations. Movie Monday! 2:15 p.m. to 3:30 p.m., Buckeye Community Room, Buckeye Library, 6625 Wolﬀ Road, Medina. Popcorn, pillows, movie. Grade levels 6 and up. Free. No registration. Drug-Free Wadsworth: What is the Medina County Health Department, 7 p.m. to 8 p.m., Wadsworth Library, 132 Broad Street, Wadsworth. Representative explains role of health department in fight to improve Medina County. American Red Cross Blood Drive; 2 p.m. to 7 p.m., Lodi Library, 635 Wooster Street, Lodi. https://rdcrss.org/2ybO4Rp Legal Resource Center, 5:30 p.m. to 7 p.m., Seville Library, 45 Center Street, Seville. Domestic Relations Court volunteers help those not represented by a lawyer in family court. First come, first served Author Event: Bernard Bertram and Honor, Meeting Room A, Wadsworth Library, 132 Broad Street, Wadsworth. Bertram shares inspiration and writing process. is additional donation request. Bring favorite dessert to share. Bluegrass bands welcome, arrive early to be scheduled. Sunday, May 26 World Lindy Hop Day https://bit.ly/2KAvihE Medina County District Libraries closed. Save Ohio Strays Meet and Greet, 1 p.m. to 3 p.m., Petco, 1052 Williams Reserve Boulevard, Wadsworth. Medina County District Libraries closed. Thursday, May 30 My Bucket’s Got a Hole Day https://bit.ly/2GGNrnC Camp Wired, 9:30 a.m. to 11:30 a.m., Medina Room, Medina Library, 210 S. Broadway Street, Medina. Learn and refresh computer skills. Ages 55 plus. Call for topics, 330-725-0588. Master Gardeners: Planting in Raised Beds and Containers, Meeting Room A, Wadsworth Library, 132 Broad Street, Wadsworth. Learn about traditional gardening alternatives. Friday, May 31 Macaroon Day https://bit.ly/2uZQsuW Summer Reading Program Kick-Oﬀ: A Universe of Reading, 11 a.m. to 1 p.m., Sycamore Room North and South, Brunswick Library, 3649 Center Road, Brunswick. Cra s, games, face painting, balloon art, NASA display. Birth through Grade 5. Read books through August 10 for prizes. Children play in MCDL locations, teens play online or in the libraries. More information at https://bit.ly/2UdvVNG American Red Cross Blood Drive, Noon to 5 p.m., Medina Library, 210 S. Broadway Street, Medina. https://rdcrss.org/2ybO4Rp American Red Cross Blood Drive, 2 p.m. to 7 p.m., Brunswick Community Recreation and Fitness Center, 3637 Center Road, Brunswick. https://rdcrss.org/2ybO4Rp Bingo for Children, 4 p.m. to 5 p.m., Medina Library, 210 S. Broadway Street, Medina. Win books, prizes. Ages 5 and up. Free. Bluegrass Jam and Dinner, 5:30 p.m. to 10 p.m., Lafayette United Methodist Church, 6201 Lafayette Road, Medina. Kitchen opens at 5:30 p.m., music starts at 7 p.m. Donation admission $3, dinner is additional donation request. Bring favorite dessert to share. Bluegrass bands welcome, arrive early to be scheduled. Submitting Calendar Events Events listed in the calendar must be a festival or fair or hosted by or bene a non-profit organization in Medina County. Send submissions to Joy@BlakeHousePublishing.com and put CALENDAR in the subject line. Event information is not accepted by phone. The calendar is also available online at JoyofMedinaCounty.com, where it is regularly updated with additional event information.